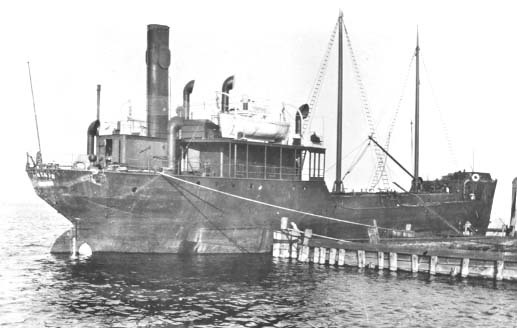 Built in 1919, the steel coastal tanker Pinthis was a typical steam vessel of the day. Following a departure from Norfolk, VA and carrying a cargo of 12,000 barrels of oil, the Pinthis collided in fog with the steamer Fairfax sustaining a mortal blow to her port side. An explosion resulted and in less than 20 minutes, the tanker capsized and sank. All 19 of her crew were lost in the sinking. The sea burned for several days following the sinking from the escaping oil. The Fairfax was set afire and many of her crew were injured or burned to death from the resulting explosion. Despite the damage, however, the Fairfax was spared. In the end, 47 people lost their lives from this tragedy. Today, the Pinthis lies in approximately 105 fsw, turtled. She is largely intact, although some of her hull plates have collapsed. Penetration into a cavern-like interior is possible, though some areas can become constricted among the mangled wreckage. The wreck has a “machine-gunned” appearance, a result of the burned out rivets once holding her plates together through which light filters. Visibility averages 25-30′ and currents are light to moderate in this area. The wreck lies on a rock and sand bottom, which helps to keep the visibility good. There is some fishing line to be weary of, as this wreck is also popular among cod fisherman. However, generally speaking this wreck serves divers well.